The savvier travelers become, the more congested the hidden gems of travel destinations become. So what’s the well-versed city slicker to do? Hit the outdoors, of course, and get in a workout while you’re at it. Luckily, the Vegas Valley has no shortage of fresh-air fitness trips to fulfill the active wanderer’s agenda. Take a break from all the decadent dining and crafted cocktails to hit the best Las Vegas trails for hiking, bicycling and running, and get a little dirt on those fresh kicks. Accessible near Hoover Dam’s visitor center or parking garage, the Historic Railroad Tunnel Trail not only offers views of Lake Mead but also makes for a scenic walk in itself. This pleasant, 3.5-mile hike travails a series of tunnels that once covered a railroad system used to transport supplies from Boulder City for dam construction in the 1930s. The tracks were eventually dismantled, and it’s since been featured in a Clint Eastwood flick, survived several fires and received a National Historic Trail designation in 2015. Don’t forget that Hydro Flask. Located in the northwest part of Las Vegas, the Lone Mountain Trail is a favorite among locals thanks to the gorgeous vistas of the valley it affords. Choose from several routes totaling three-plus miles of hiking. The Lone Mountain Trail is good for hikers of all levels, but keep in mind loose terrain on the incline—opt for a stronger-soled sneaker than your Nike Frees. Ideal for mountain bikers, check out Bootleg Canyon if it’s adventure you’re after. From downhill trails to rocky rides, the roughly 35 miles of biking is even available for night trips, if you’ve got the right gear. Start your ride at any one of the parking lots just south of the canyon. Like the Historic Railroad Tunnel, these trails include scenic views of Lake Mead and Hoover Dam. And for the ultimate trip, hike or shuttle up 3,600 feet to the top of the canyon for a memorable ride down that keeps visitors returning year after year. 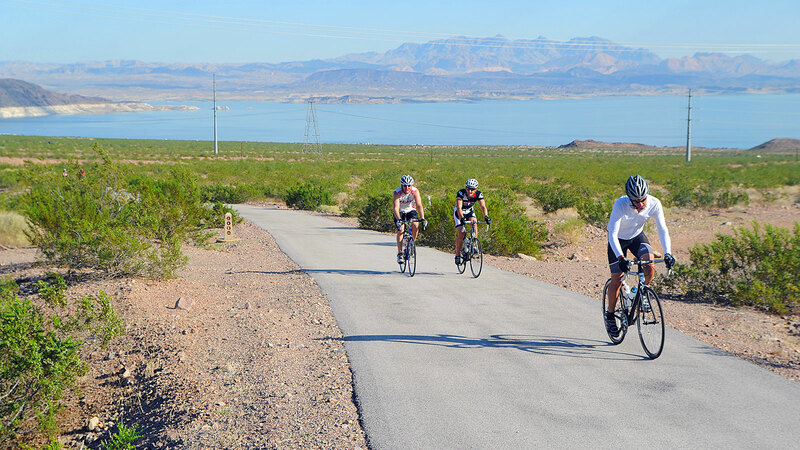 The River Mountains Loop offers an exciting way to get some exercise while seeing both the residential and recreational side of the Vegas Valley. Also boasting trails near Lake Mead (how big is that reservoir, anyway? ), for 34 miles the loop extends to Boulder City, Henderson and Las Vegas proper. Enter at any one of the trailheads, just keep in mind you may encounter casual walkers and horseback riders along the way. Also, nearby? Bighorn sheep—River Mountains is home to one of the largest population areas of Nevada’s official state animal. The City of Henderson is known for its community feel, so it’s no surprise this is just the type of trail where you might see a neighbor jogging by. Located about 20 minutes from the Las Vegas Strip, Amargosa Trail comprises six miles of mostly paved paths and includes lighted sections, educational kiosks and various forms of play—think splash pads and bocce ball—at each trailhead. The best part? After 2.5 miles of hitting the “pavement,” the trail leads into the neighborhood’s foothills. Photos courtesy of Las Vegas News Bureau and City of Henderson.